This innovative bracelet is part of Thomas Sabo's Love Bridge collection. The shimmering strap of this bracelet is made from 925 Sterling Silver woven into beige Mokuba Ribbon, and then vaporised with Silver. The effect of that is a glistening golden rope. 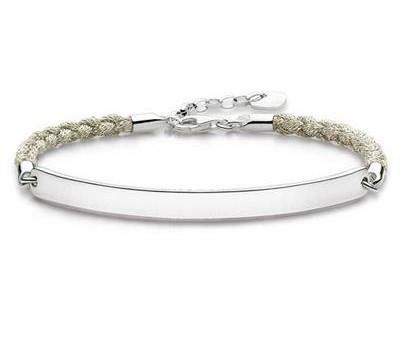 With its engravable Love Bridge bar, this bracelet is the perfect romantic gift to cherish.